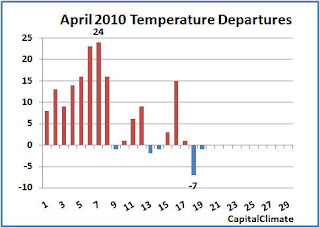 The Weekday program on KUOW radio in Seattle today had a discussion of the disagreement between many broadcast meteorologists and climatologists on the subject of global warming. John Coleman is a weather forecaster in San Diego. He is one of the founders of The Weather Channel. Bob Henson is a science writer for the University Corporation for Atmospheric Research, who trained as a meteorologist. His book "Weather on the Air" about the history of TV weather is coming out in June. Nate Mantua is the co–director for the University of Washington Climate Impacts Group and a professor at the School of Aquatic and Fisheries Sciences. The high and low were within less than 2 hours of each other (9:20 and 11:06 pm, respectively). This month drops to fourth place, behind 1985. 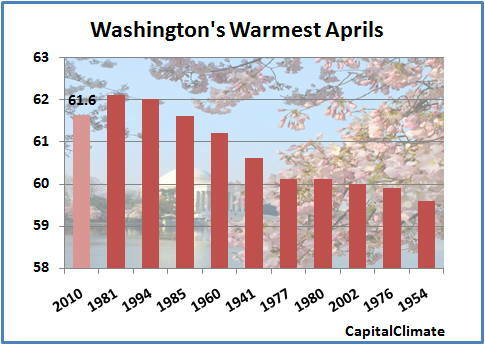 Following the coldest day of the month on Sunday the 18th and a slightly below normal Monday, Washington's average temperature for April has dropped to 61.8°. This makes April 2010 the third warmest April so far, behind 1981 and 1994. 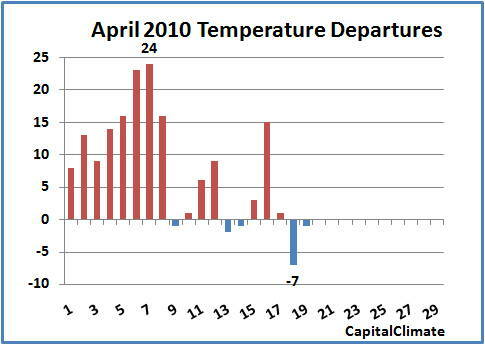 Near average temperatures forecast the rest of this week will likely further erode the month-to-date average. Ken Kaye reports in the Florida Sun-Sentinel's hurricane blog that long-time Weather Channel tropical expert Steve Lyons is leaving that position. 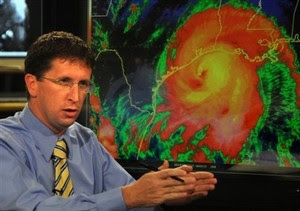 Rick Knabb, formerly a senior hurricane specialist at the National Hurricane Center, will replace Lyons for the 2010 hurricane season, which begins in less than 6 weeks. Lyons will be the meteorologist in charge of the San Angelo, Texas office of the National Weather Service. Geoffrey Darby, executive vice president of programming for The Weather Channel, said, "Rick brings tremendous experience to this role and is no stranger to high profile hurricane activity, having worked with the National Hurricane Center (NHC) during the record-setting 2005 Atlantic season. He will help lead our on-air and cross-platform tropical coverage, providing continuous updates as hurricanes and tropical storms develop." As a senior hurricane specialist at NHC from 2005-2008, he prepared and issued official forecasts and warnings during the 2005 hurricane season with Hurricanes Dennis, Emily, Katrina, Rita and Wilma. Perhaps most notably, Dr. Knabb signed the advisory announcing that Katrina had become a major hurricane over the Gulf of Mexico. He also served as NHC's science and operations officer from 2001-2005. Most recently, Dr. Knabb has been deputy director and director of operations of the Central Pacific Hurricane Center (CPHC) and NWS Forecast Office in Honolulu, Hawaii. While there, he led the development and implementation of the first-ever joint CPHC/FEMA hurricane preparedness course for emergency managers. Throughout his career in NOAA, in addition to personally preparing and issuing more than 200 official tropical cyclone operational forecast packages, Dr. Knabb has been involved in emergency management, military and academia collaboration, technology incorporation, and public speaking and media interviews.